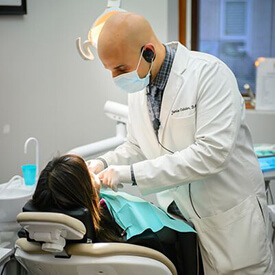 Whether it’s time for your child’s first checkup or your aging parent is overdue for an appointment, our team at Roselle Park Dental & Implants takes the same approach with all of our valued patients – prevention is best. Our talented doctors and staff members will work closely with you to catch problems at their earliest stages and strengthen your smile’s health however we can with high-quality services. All the while, we’ll treat your whole family with the kindness and personalized care you deserve. Please contact our Roselle Park location to learn more, or if you’re ready to schedule a visit. From the moment you step inside our office, we want you to feel comfortable and right at home. That’s why our team will always give you a tour and provide you with a gift bag! After ensuring that you’ve completed all of the necessary paperwork, it will be time to undergo an in-depth evaluation of your current oral health. This process will feature many important steps, including the capturing of digital X-rays, an up-close look at the mouth with the help of our intraoral camera, an oral cancer screening, and potentially fluoride treatment. Once we understand the concerns you’re facing in full, we can help you start formulating a plan for tackling them right away. We recommend that patients of all ages attend at least one checkup and cleaning every six months, or two each year on average. These services are vital because they help us become familiar with your unique smile and any issues it’s facing, making any necessary treatment simpler and more effective in the long run. Routine cleanings will also get rid of dangerous plaque accumulation and leave your teeth beautifully refreshed! We love seeing the whole family here in Roselle Park, and that includes the youngest members who may be just getting started on their oral healthcare journey. Our entire team makes every effort to provide your loved ones with the kind, age-appropriate approach they need to smile brighter – that’s why we have our very own pediatric dentist! Dental sealants, children’s orthodontics, and many other valuable services are available when needed, and you’re always welcome to visit our sister site Little Smiles of Roselle Park for more information. Getting your wisdom teeth (the third molars that typically show up when a patient is between the ages of 16-22) is often seen as a rite of passage for young adults, but unfortunately, it’s not always a happy occasion. Today, most mouths simply don’t have the necessary room to accommodate these late arrivals, which can result in impaction, overcrowding, higher risks of infection, and other serious issues. Our Roselle Park team will be sure to keep a close eye on the development of these teeth in younger patients, and if we determine that complications are likely, removing them may be a worthwhile preventive measure that can protect your smile in the long run.